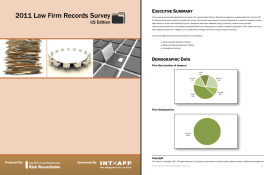 Following our other recent survey activity, we're pleased to conclude the 2011 Law Firm Records Management Survey. This project was initiated in conjunction with a Roundtable member firm interested in taking a "quick pulse" of peer policies, practices and priorities. It was a great success, with representatives from 27 AmLaw 100 firms participating over the course of three weeks. Questions explored current and planned law firm records retention policies, related technologies and other facets of information lifecycle management. Thanks to all who participated. You will be receiving a copy of the summary report shortly.